Nadim’s Mediterranean cuisine has been a favorite dining experience in Western MA since 2000. Operated by Nadim Kashouh, Nadim’s Mediterranean cuisine is known as the “go – to” Destination for authentic Mediterranean food. 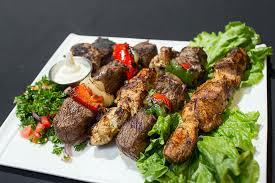 Nadim’s Mediterranean cuisine offers dine in, take out, order online, private parties, and catering. Come see why we are voted #1 year after year! Voted BEST MIDDLE EASTERN RESTAURANT year after year after year by Valley Advocate Voters.